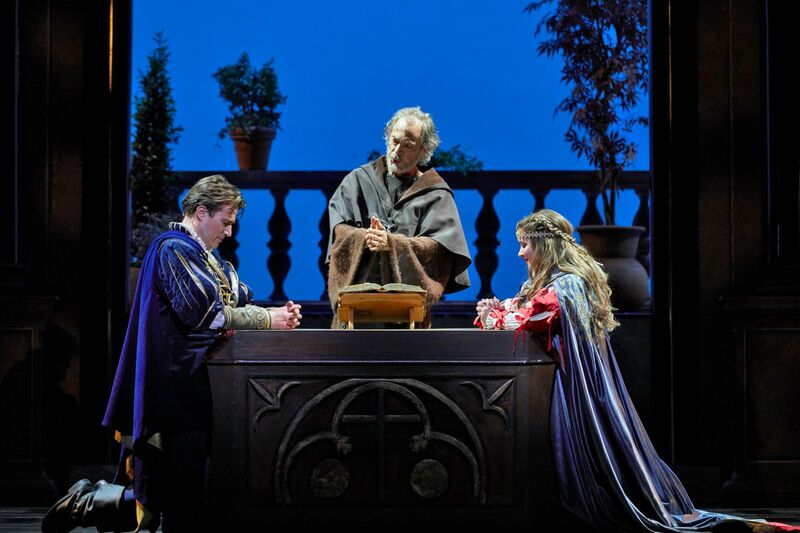 Calgary Opera opened its new season in daring fashion on Nov. 17th with a bold and expensive production of Charles Gounod’s five-act tour-de-force, Roméo et Juliette. Current General Director Keith Cerny impressively finessed bringing Claude Girard’s famed, 1986 Opéra de Montréal touring production to Calgary. He also negotiated a collaboration with Alberta Ballet to add some of the much-needed dance back into the opera. We couldn’t ask for better, except of course, excellent performances, and there were plenty of those on display Saturday night. The evening was very nearly upstaged by Calgary Opera’s welcome and highly anticipated news of two key appointments. Prior to the performance, Board Chair Jacqueline Pyke announced that starting January 2019, after one year as GD and CEO, Keith Cerny would hand over the reins to Heather Kitchen, CO’s new Managing Director and Chief Executive and Artistic Director, Bramwell Tovey—a considerable coup. Mr. Tovey’s appointment carries considerable heft especially after the prominent artistic success he helped engineer at CO two seasons ago when he and director Kelly Robinson debuted a smooth and surreal production of Korngold’s Die tote Stadt. All of this also serves the company’s well-earned reputation for mounting new opera (Tovey premiered his own new work The Inventor there in 2011). Thanks to former GD and CEO Bob McPhee, CO has premiered more new works than any opera company in Canada, and remains a dedicated leader in North America in that regard. And with Joby Talbot/Gene Scheer’s Everest coming up in February, that reputation seems secure for now, but Kitchen and Tovey likely face challenges avoiding future deficits, particularly in these fiscally tight times given the oil market crash several years ago and now, a second significant decline of the sector in recent weeks. It makes it all the more significant that such an excellent production of Roméo et Juliette could be delivered to open the current season. 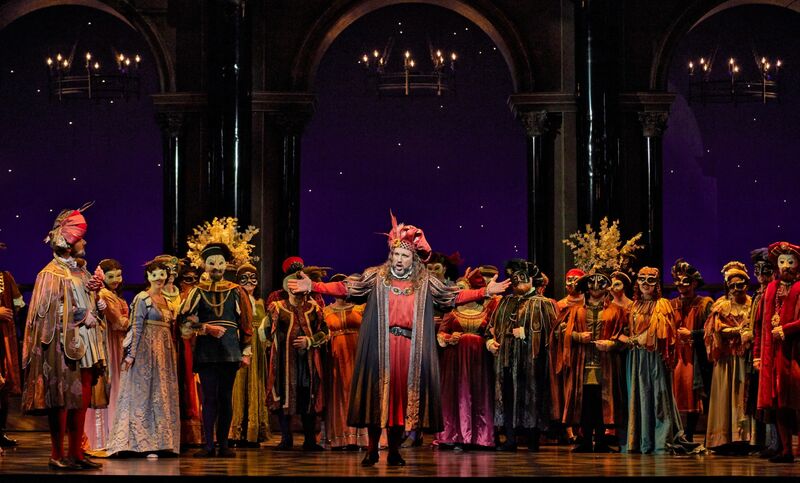 It is also conspicuous that once again, CO is having considerable artistic success with the somewhat unconventional—namely, another lengthy five-act French opera, which, like Faust and Manon, have been popular with the city’s opera-going public in recent seasons. With minimal cuts from conductor Gordon Gerrard, whose excellent musicality guided a harmonically mature Calgary Opera orchestra through every single chord, the stylistic milieu was perfectly framed for a protracted evening of French lyric tableaux. Adding two dance scenes might well have caused the narrative fabric to knot up in places, but director Jean Grand-Maître secured a win by making the dancing, fight scene and four love duets flow-through effortlessly. And Grand-Maître’s direction throughout gave everyone plenty to do, particularly in the family-feud fight panels; a moving, slow-motion scene when Pâris meets a thoroughly repulsed Juliette who faints dead away, and the appropriately engaged, solid Calgary Opera Chorus. 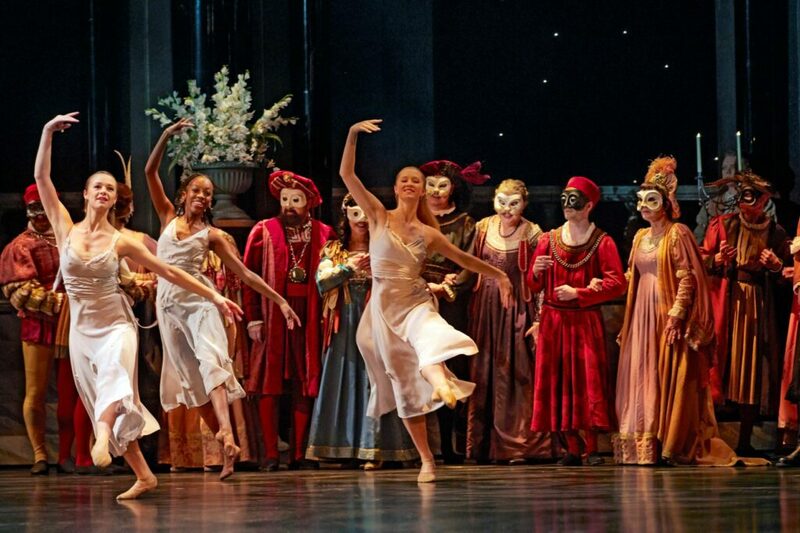 Gounod famously ‘reduced’ Shakespeare’s original to a series of love duets, with the action surrounding them considered superfluous by many of this opera’s critics. Not so: there are golden moments such as Mercutio’s ‘Queen Mab’ ballade which Peter Barrett sang superbly on Saturday night. His performance formed a key dramatic highlight. In addition, Megan Latham was great as nurse Gertrude, perhaps one of the best I have seen or heard. Stephanie Tritchew was fun, and even coquettish, in the trouser role of Stéphano—a remarkable success, in what can come off as an awkwardly-inserted mezzo-soprano role. Equally fine were Alexandre Sylvestre’s Capulet and Uwe Dambruch’s commanding Duke. But perhaps most impressive was audience favourite Alain Coulombe as Frère Laurent. His was a vocally secure, sympathetic portrayal of the naïve monk who only wishes to do good, but ends up causing the deaths of both the people he is trying to help. There was a subtle complexity to his performance, thanks also to Grand-Maitre’s astute direction. Leads Anne-Marie MacIntosh (Juliette) and Adam Luther (Roméo) brought youthful vigor filled with tremendous vocal push and power—requisites for performing Gounod’s lyric masterpiece. There was a lot of vocal security here from these young singers and it was evident that both were focused on musical matters more so than dramatic ones. Onstage chemistry, however, was not in frequent evidence, nor was movement and gesture linked to music quite as fluidly and naturally as one might wish—crucial components in French opera. Jan van der Hooft‘s physically adept Tybalt was an excellent swordsman (hats off to Fight Director J-P Fournier), and it is evident from his stage bearing that he must have trained extensively to pull off such a demanding role with complete movement acumen. 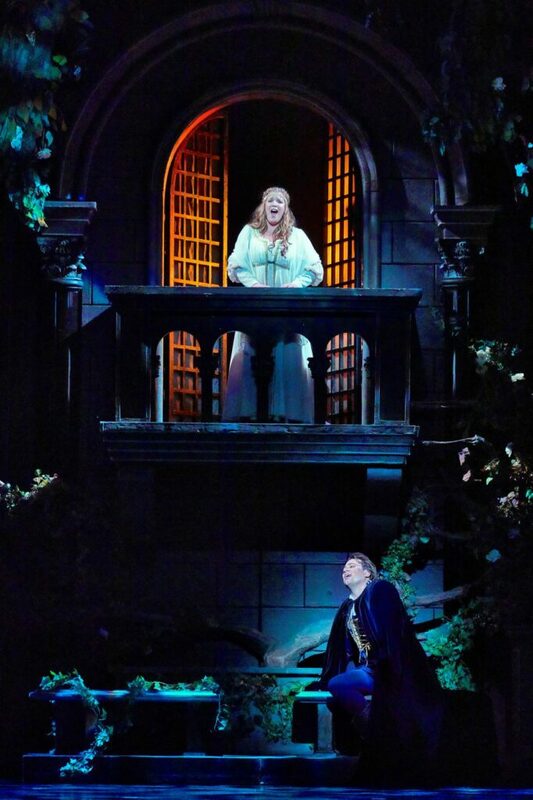 He is a refined lyric tenor now in CO’s Emerging Artist Program and it was clear from this performance he should grow into a wide variety of roles as his career develops. 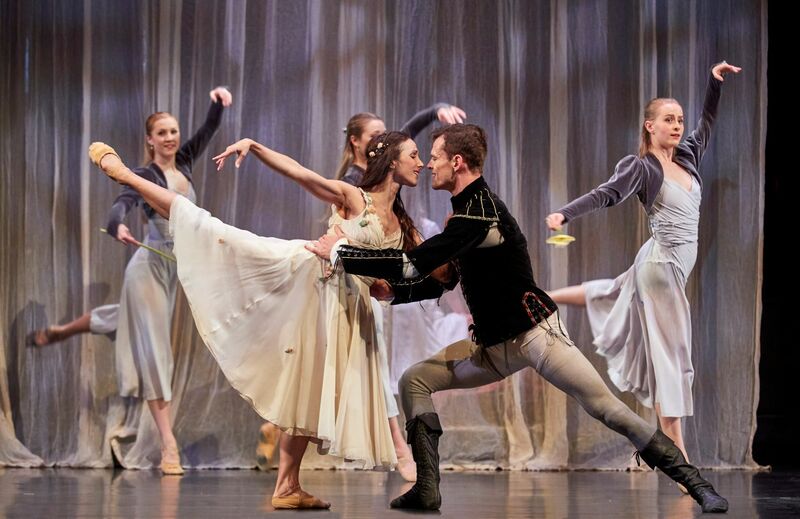 Alberta Ballet’s Garrett Groat and Hayna Gutierrez were supreme in their Act I ‘Bohemian Couple’ scene, danced without Marley flooring which limited their movement. Groat’s ballon was beautifully executed and Gutierrez epitomized period grace with lovely ballonnée and développé, all to perfectly partnered Bournonville technique—a feast for the eyes of ballet fans. Kudos also should go to students from the School of Alberta Ballet for dancing so well on original flooring. Grand-Maître’s ‘Six Young Maidens’ wedding flowers dance “imbued the room with the scent of lilies” as the great British ballerina Margot Fonteyn once said—a perfect counterpoise matching fertility with imminent tragedy; an ideal summary of a classic literary work that epitomizes love burning brightly even into death.